We have stories about about the benefits of green construction and how to choose LED light bulbs. Both are good for the environment and your pocketbook. As a New England-owned company we love talking about companies who share our values and believe in good business practices. Both Cambridge Brewing from Massachusetts and Maine based Flowfold have embraced environmental and energy saving practices. Like you, we are inspired by the creativity and ingenuity of these companies and initiatives. We welcome your comments, feedback and story suggestions. Private: Unplugged and Involved. How I Embraced Volunteerism. Seven Stages Shakespeare Company (7SSC) is a professional ensemble of creative artists dedicated to generating a local and global dialogue by presenting exciting and accessible presentations of the works of William Shakespeare. Seven Stages Shakespeare Company (7SSC) returns to Prescott Park. Photo Courtesy Bushor Photography. Through their Power To Help initiative ENH Power will be sponsoring the 2015 summer season of the Seven Stages Shakespeare Company (7SSC). Entering into its fifth summer in 2015, Shakespeare in Prescott Park brings full productions of the Bard’s work to Prescott Park in Portsmouth, NH. This summer 7SSC will be back on Sunday afternoons mid-July through mid-August with “As You Like It” produced in partnership with Prescott Park Arts Festival. From June 5th-13th 7SSC will present “What you Will, (or twelfth night)” produced at and in partnership with 3S Artspace in Portsmouth. All of Seven Stages Shakespeare Company’s performances are FREE FOR ALL, Or Pay What You Will. Christine Penney, co-founder and Producing Director of 7SSC relies on donors and sponsors to keep the arts affordable and accessible “our programming would be impossible without the support of our dedicated donors and sponsors like ENH Power. We think the cost of a ticket should not prohibit anyone from experiencing Shakespeare, theatre, or any art for that matter. Eliminating the financial barrier to entry allows us to bring Shakespeare to diverse new audiences. Our donors and sponsors literally make this possible, and for that we “…can no other answer make than thanks, and thanks, and ever thanks.’ Twelfth Night III.3”. The Power to Help, an initiative of Provider Power (ENH Power, Electricity Maine, Provider Power Mass) seeks to bring together the people who are looking to enact change (business and non-profit leaders), with an understanding of energy in everything we do. While electricity is what we sell, it is also a means for us to support and raise awareness of groups and individuals working towards positive change. To learn more about Provider Power’s Power to Help initiative, visit www.powertohelp.com. For ticket or other information about Seven Stages visit www.7stagesshakespeare.org. Cambridge Brewing Company, a fixture in Cambridge, Mass, balances great beer, a hearty meal and sustainability practices. Ask Cambridge, Mass. locals where to find a great meal and beer, and chances are they will say, “Cambridge Brewing Company,” which has been a fixture on the local dining scene since 1989. But step into their restaurant or peruse their menu, and you’ll see they’re about more than just a friendly environment. They’re also about being environmentally-friendly. Start with the ambience of the restaurant: The CBC is located in a refurbished mill building that features high ceilings, exposed brick and skylights. The lighting is LED, the cleaning supplies are non-toxic, and employees frequently bike to work. They are also committed to a zero-waste brewing process – from conserving and re-using water to offering spent grain to local farmers for animal feed. For its seasonally-inspired New England fare, the restaurant sources from as many local producers as it can, which not only assures that the ingredients are fresh but allows them to support those committed to what they call “the stewardship of land and productivity of the seas.” Partnering with local suppliers allows them to shorten the supply chain and help to create a strong local economy. Bannatyne says he’ll find new suppliers through the existing network. “Word gets out among local farmers and small-scale fisherman that we are a business that’s excited about talking to them, and they are important to us.” He also finds connections when he’ll mention to a farmer, for example, that he’s trying to source a certain ingredient and he’ll get a reference. The website lists the businesses, farmers and organizations they work with that match their commitment to sustainability and community and includes the specific item and time frame – from Ben “The Mushroom Guy,” who forages local mushrooms, ramps and fiddleheads; to Shy Brothers Farm, whose cheese is featured year-round. According to Bannatyne, the sustainable focus is important to the customers – particularly the dinner crowd who seek them out for their reputation. Inspiration can come from the most unusual settings. How a tattered leather wallet can inspire a teen to one day start a business. So many successful businesses start with solving a problem. For Charley Friedman, president of Flowfold, inspiration struck as a teen, when he noticed that his grandfather’s leather wallet was falling apart. He was working as a sail maker at the time, and he designed a replacement wallet using scrap sailcloth. That was the beginning of the Peaks Island, Maine-based accessories company that produces wallets and other gear from recycled sailcloths. Flowfold, which gets its name from a geology term that describes layers of rock that fold smoothly over time without breaking, officially launched in 2011. Flowfold has so much confidence in the strength of its materials and craftsmanship that all of its products are backed with a lifetime warranty. Even better, its commitment to using recycled materials has helped Flowfold divert over 1,500 pounds of non-biodegradable materials from landfills. Flowfold currently has just three full-time employees in addition to its two owners, but McNeill says the company grew 150 percent between 2013 and 2014. The products can be found in over 150 brick and mortar stores across the county, while the majority of sales are done online. Even with encouraging numbers, McNeill says that the company’s impact is what really counts, thanks to its quality products that allow users to have confidence in what they carry. The combination of cutting edge materials and Maine craftsmanship has helped Flowfold create a unique product line that is expanding. “Just this week we released the passport holder and a checkbook case. We have such a loyal and great customer base that wants more products,” says McNeill. Gorham Savings Bank named Flowfold as its third annual LaunchPad Competition winner. LaunchPad was created to help fund the growth of a Maine business. It not only celebrates great business ideas, it also provides the resources to help bring these ideas to life. Flowfold was named this year’s winner after a live, high-energy competition on June 18th. Hiring the right green builder can help you save money in the long run because energy-efficient homes have lower utility costs than less efficient ones, and it can improve the air quality of the home for your family’s health. As you’re vetting potential builders for a green home project, here are some things to consider. You don't have to live in a tree house to consider living in a green or eco-friendly home. For homeowners committed to sustainable design, finding a company that’s well-versed in the principles of green building creates additional challenges on top of the usual ones around budget and timeline. That said, hiring the right green builder can help you save money in the long run because energy-efficient homes have lower utility costs than less efficient ones, and it can improve the air quality of the home for your family’s health. In fact, the EPA’s Energy Star website features an interactive map where you can locate builders who meet Energy Star’s energy efficiency guidelines. Is the builder licensed and insured? Whether hiring a green builder or not, your first order of business should be checking whether the builder is licensed as a general contractor in your state. If you’re looking specifically for a green builder, you should also ask about any special green building training or certifications such as LEED. Have you talked to the team? Often a company’s owner or project manager will be the one discussing specs for a job, but it’s the job crew who’ll actually be on-site doing the hands-on work. You’ll want to meet them as well and ask about their training in green building practices. How do they plan to minimize construction waste or avoid disrupting vegetation? Are they experienced at installing solar electric systems or energy-efficient windows if those features are important to you? Did they explain their processes in terms you can understand, or just shrug off your questions? Did you check references? A trustworthy builder should be happy to put you in touch with past clients. In talking to other clients, try to go beyond standard questions like how close the builder came to the initial timeline and budget. Ask about whether the builder suggested eco-friendly materials like low-VOC paints or salvaged wood, or if the homeowner had to insist on them. Once you’ve found a green builder you trust, put your environmental expectations in writing as part of the contract between you and the builder. 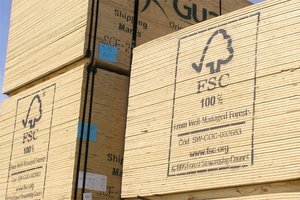 A verbal agreement that you want FSC-certified wood and attention paid to avoid compacting the soil is not the same as getting those expectations in writing. If you’re working with an architect, he or she should draft a spec sheet outlining your green goals around practices and materials. Ask the tough questions to ensure that your builder can meet your needs and put you at ease. The term “LED” has been getting more and more buzz as we try to move towards a lifestyle of conserving and saving energy. We hear people telling us they’re important to use, but are hesitant to actually buy them because of the price, type, and all of the terminology that comes with it. Ahh, the Light-Emitting Diode…otherwise commonly known as the LED. We’ve all heard of them, but do we actually know how LED light bulbs are different from other bulbs (such as the traditional incandescent light bulb)? The term “LED” has been getting more and more buzz as we try to move towards a lifestyle of conserving and saving energy. We hear people telling us they’re important to use, but are hesitant to actually buy them because of the price, type, and all of the terminology that comes with it. Have you seen our cool videos (links are in the next sentence)? We have already debunked the myths and given you some visual comparisons about the LED bulbs. As I’m sure you’re aware of, there are still many technical terms about them that would be helpful to know when shopping around. These can be hard to understand, but without knowing them, it can make it hard for the common consumer to choose the perfect light for the home. Let’s explore! First thing’s first: the Light-Emitting Diode – Simply put, like any other light, the LED is a semiconductor device that emits light when an energy current passes through it. Unlike traditional lighting, the LED does not require the heating of a filament to light up. Instead, they use chemical compounds to produce more efficient light. Naturally, the LED is not a white light source, which is why they are they are commonly used for things like street lights, colored holiday lights and digital billboards. To make the light white so we can have normal looking lights on our homes, they use two methods. One is phosphorous conversion, where phosphorous is put onto the diode to it can make white light. The other, known as RGB conversion, is when red, green and blue light is mixed, resulting in white light. LED lights are far more sophisticated than incandescent bulbs, as different types can let off a different shade or color or white light. They can be dimmed and the big benefit is that they produce the same amount of power as the incandescent blubs but use much less energy to do so. It’s a win-win if you know what you’re looking for when you’re at the store. Color Temperature is the shade of color that characterizes the how the white light looks. For instance, if the light gives more of a blue color, it would have a “cool” temperature, and if it’s more yellow looking, it would be “warm” in temperature. So, depending on which part of your house you want to put the lights in, paying attention to temperature is helpful. This is mostly visual, so if you have a particular temperature in mind for your home, you should refer to the package to find out exactly what the Kelvin color temperature is. But, how do we know which kind of light certain Kelvins will put off to choose? Kelvin Color Temperature is the measure of the color of a light source relative to a black body at a particular temperature, which is measured in degrees Kelvin (K). Incandescent lights have a low color temperature (about 2800K) and have a red-yellow tone. Daylight lighting, such as fluorescent lights, has a high color temperature (about 6000K) and looks bluish to the eye. White light is somewhere in between 5000-6000K, LEDs can but LEDs can be found in all of these shades, too. 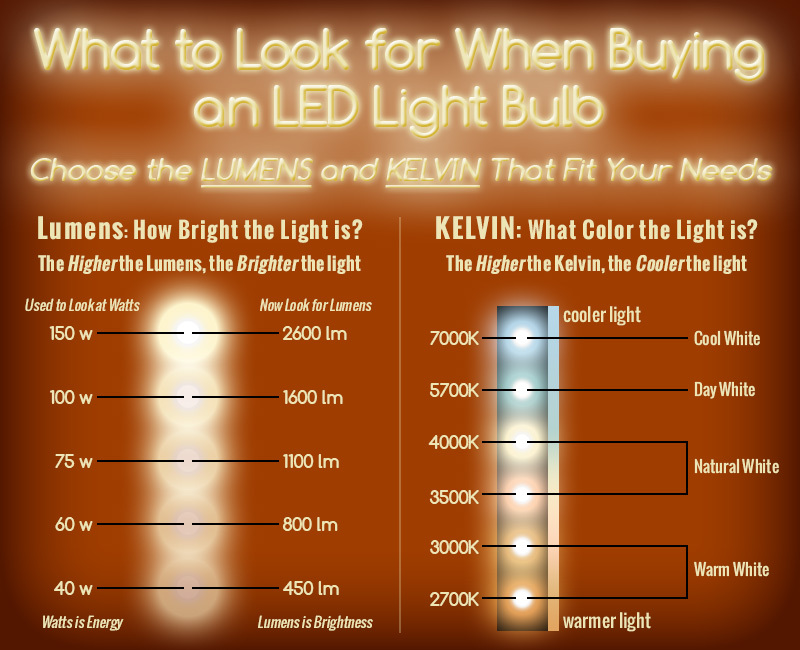 You just have to know a little about Kelvins and you’ll be all set when choosing which light you want! All of that information can be found on the packaging of the product. A lumen is the measurement of light that is relevant to humans. The lumen scale indicates the amount of light (brightness) that our eyes can perceive. Simply put, lumens measure the amount of light produced by that particular bulb in which we can see, and is what most people look at when shopping for LED lights. It is important to remember, however, that lumens do not describe the quality of light generated – that would be referred to as color temperature, explained above. In my opinion, knowing about lumens and watts when choosing which type of light to buy is the most important thing to remember. For example, the average 60-watt incandescent bulb produces 800 lumens, whereas it only takes 4.5 watts to produce 800 lumens using a LED bulb (give or take, depending on the brand and make-up of the bulb). As you can tell, it takes much less energy to power a LED blub, but still has the same brightness that we’re used to seeing with traditional bulbs. Keep this in mind when deciding whether to pay the price for LEDs – they will pay themselves back (and more) over the longer life span of the bulb. For some reason, LEDs have this notion around them that they are different, do not produce as pretty light as incandescent, and all they do is cost the consumer more. None of those points are true, though. By understanding these common terms, you will now be able to confidently pick out LED bulbs that are sufficient for each area of your home, depending on how you want the color and how much light you want the specific light to let off. At the end of the day, your investment on replacing bulbs now will pay off in the long run, as LED bulbs last much longer than incandescent ones and use less energy, which will save you tons on your electricity bill! Since being back in Maine I attend more events, volunteer and explore my community. Being blessed to work for a company that embraces volunteerism and community certainly helps. Disconnecting from technology, volunteering more and networking has helped me to connect in ways I never imagined. Taking time to disconnect from technology can help us connect in other ways. How many of you remember a childhood without computers and other electronic devices? While I was growing up, at our house, we had one giant, old school computer in our house that the whole family shared; it wasn’t until I turned 13 that I really knew how to use it. For me, in the early years computers weren’t much more than glorified word processors. Today many schools give laptops to every 6th grader. The Internet wasn’t worth the wait. It took about 10 minutes to load a page. Today-information takes milliseconds to pass from place to place. As for cell phones, I didn’t get my first flip phone until I was 15. No texting, no camera, and only to be used for emergency purposes. You know what? I didn’t mind the limited access to a computers and cell phone. I didn’t give it a second thought. I was busy doing other things, like spending time outside, talking face-to-face with actual people, and, gasp, using the land line to get a hold of my friends. Today, we have an endless number of these devices right at our fingertips. Now, I am not saying that that is a bad thing. Technological advances are great and important for personal and business needs. However, I do think that my generation (hello, 90s babies!) and especially younger generations need to learn some time management skills. To be more specific, we need to manage to make time for more face- to- face interaction with other people. Instead of meeting and chatting with people online, we should try to make more of a conscious effort to meet new people out in the community, or by joining groups that spark our interest. Having trouble putting down the cell phone? Perhaps this will help or inspire you. Here’s the journey I started two years ago (and it really helped). Growing up I was very shy, preferring to sit in my room and watch TV then go out and really socialize. This continued through high school and even college. I got by, but I also knew I wanted to be successful in the business world. Being shy just wasn’t going to cut it. So, in the spring of 2013, I made a change and decided to do something about it and push my limits. I flew all the way around the world to Australia (where I knew no one) to participate in a Study Abroad program for four months. I literally had to disconnect myself from all technology for the first two weeks of the trip, and it turned out to be two of the best weeks of my life. Granted, for those weeks, I was busy being a tourist with my new found friends. Being away from the computer and phone really made me think about the importance of putting myself out there, exploring the community and people around me. From there on out, I elected to not have a cell phone during the four month period. The only technology I had was a computer and spotty Wi-Fi. Since I was hardly ever in my room, I hardly missed a thing. While in Australia I had the opportunity to volunteer at the 2013 Association of Surfing Professionals World Championships. While in Australia I volunteered at a few different events. I met a ton of new people, had real conversations, and learned that putting yourself out there – whether it’s volunteering or civic engagement – is one of the most fulfilling things a person can do. Since being back in Maine I’ve made it a point to explore my community more. I attend more events, and volunteer when I have the time. Currently, I am part of a volunteer group called YPLAA, where we plan events in our community to bring professionals together to network and have fun. Here at Provider Power employees are encouraged to volunteer, even on company time. We are providing numerous opportunities to interact with non-profit groups, and get hands on experience with these organizations. Volunteerism is part of the corporate culture here. Last summer I volunteered with one of the Electricity Maine Power To Help partners, St. Mary’s Nutrition Center, where I helped kids learn about and cook nutritious meals As a company we are active with the United Way of Androscoggin County, regularly participating in their Day of Caring. With volunteers, staff and some of the families served by the St. Mary's Nutrition Center of Maine. Photo courtesy St. Mary's Nutrition Center of Maine. I am blessed to work for a company that values the importance of volunteerism and networking. I’ve met more people in the past two years than I have at any other point before that, and the rewards are endless. Volunteering and helping others, while putting myself out there and exposing my vulnerabilities has helped me to personally grow and gain a new level of confidence. My point is this. Taking time to disconnect from technology can help us connect in other ways. Freeing your mind free from cell phone notifications and social media updates can and is a good thing. It is good for our own personal growth, as well as the growth of the community we are in. Don’t get me wrong, I see the irony in writing this in a blog. So, when you are done reading this, I encourage shut down your computer, and put down the phone. You will be glad you did. A sign posted at an animal preserve in Australia. Tara Foley had a vision of immersing herself in learning about natural healthy skin products. Five years later, her dream became reality in Boston. Follain is a healthy beauty store with locations in Boston and Nantucket. Tara Foley already did yoga most days and shopped at her local farmer’s market, but several years ago when she started researching the beauty products she used, she quickly learned they didn’t fit with an otherwise clean, healthy lifestyle. “On average, we use about 15 products a day, and most of the products I was using had a lot of toxic chemicals in them,” she says. Foley tested products with safer ingredients, but discovered that many of them just weren’t as effective. She began a blog, The Natural Chemist, in which she reviewed the products that did work, and quickly discovered that people needed a place to buy those products. She quit her job at a law firm in 2010 so she could “fully immerse myself in this world and learn about natural healthy skin products.” First stop was a lavender farm in France. Through Willing Workers on Organic Farms, Foley worked at the farm so she could “see how something that we put on our skin was brought to life.” Next, she moved to Maine, where she worked for a small skincare manufacturer and learned about packaging, then to Wellesley, Massachusetts, where she earned an MBA from Babson College in 2013. Through a national business plan competition, Foley received seed capital to open Follain, a cozy retail shop in Boston’s South End. The location was ideal in part because of Boston’s proximity to so many researchers and health professionals. Select products (think: liquid hand & body soap) are available for refill in-stores, as Follain aims to remedy the immense plastic waste generated by bottles. Follain’s white-tiled counter and vintage apothecary tools create a chic, clean backdrop for the store’s selection of nontoxic skincare, body and hair products, as well as cosmetics, all from US-based brands. Foley thinks not only about the products we put in our bodies but the packaging that gets discarded afterwards, so she created a refill program where customers purchase a container and bring it back to refill with a rotating selection of liquid hand and body soap (as of February, the current soap on tap contained only coconut oil, olive and essential oils). Foley says she “became really excited about the opportunity to fix the packaging part of the beauty industry” while studying at Babson. Seven Stages Shakespeare Company (7SSC) will be back on Sunday afternoons mid-July through mid-August with “As You Like It” produced in partnership with Prescott Park Arts Festival.